The Dudley Sustainable Neighbourhood Group is holding Nature Play sessions for children and their parents. There’ll be climbing, creating, imagining, building, investigating, thinking, engaging and more! So come along and experience the fun. Children must be accompanied by an adult. Wear enclosed shoes, long pants and sleeves and bring wet weather gear and/or sun protection as the day requires. Bookings not required. Drop in any time between 10am and 1pm. For more information, visit www.sustainableneighbourhoods.org.au/nature-play. Kids of all ages embraced the opportunity to enjoy the great outdoors at the Dudley Sustainable Neighbourhood Group’s Nature Play Workshop in September 2015. Niki Buchan, a well known nature play advocate, lead children and adults in a range of nature-based activities. 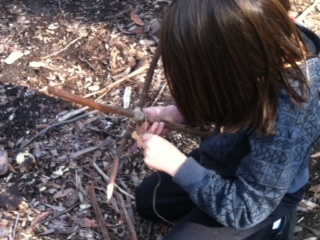 Participants enjoyed a nature trail treasure hunt, tepee-building, investigating the bush and gardens with magnifying glasses, climbing, using tools like saws, drills and whittling knives, sieving for bugs and worms, making rope swings in trees, and making fires with a firesteel. Participants were inspired by the outdoor environment as they learned about using tools safely, and were encouraged to explore and relax. 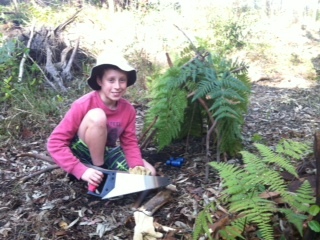 Eight year old Ella said that she would “do more stuff like this in the bush and the backyard”. The workshop is part of a project funded through Lake Macquarie City Council’s Environmental Sustainability Grants Program. As part of the project the Dudley Sustainable Neighbourhood Group are working to enhance the existing nature trail at the Awabakal Education Centre, and are planning a spotlighting adventure for early next year. Keep an eye out for us at the Healing Haven Markets in 2016.